Hamilton, Bermuda, July 12, 2016 /3BL Media/ – It’s been said that good starts make excellent finishes. This is true both with the production of premium spirits and corporate responsibility, like the employee initiatives nominated for the 2nd Annual Bacardi Limited Good Spirited awards. A total of 11 employees, teams and facilities received recognition for their outstanding environmental achievements within five different award categories. From new bottle recycling plants in India, using reclaimed MARTINI® cork plugs for building materials, and a no straws campaign, among other programs, the winners and honorable mention recipients produced many gains through a variety of methods. In the process, several facilities garnered the highest government approvals and certifications for clean burning biomass use and supply chain efficiencies. 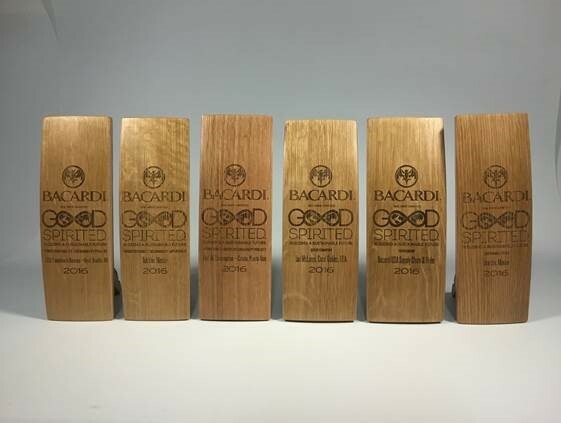 The noteworthy, eco-conscious endeavors recognized with the Good Spirited awards will provide Bacardi with long-term improvements and reductions for a more sustainable future across operations, packaging and responsible sourcing and will drive the Company’s global infrastructure closer to its goal to reach a net-zero impact—to put back into the environment at least as much as it takes away. Naturally, in support of the Good Spirited mission, the award trophies are made from recycled oak and acknowledge activities between April 1, 2015 and March 31, 2016 (FY16). Winner: Tultitlán, Mexico – For its multi-facility “Clean and Lean” programs, the Federal Environment Protection Attorney's Office (PROFEPA) bestowed “Clean Industry” certificates for all three of the Company’s facilities in Mexico: the La Galarza distillery, just northwest of Puebla and southeast of Mexico City; the BACARDÍ® bottling plant in Tultitlán; and the Jalisco, Arandas-area Tequila CAZADORES® distillery and bottling facility. The rare Clean Industry distinction identifies exemplary companies that go well beyond regular environmental compliance regulations to demonstrate exceptional social commitment. Honorable Mention: Pessione, Italy – The Pessione facility, which distills and bottles MARTINI® vermouth and Italian sparkling wines, became 100% waste-free in FY16 as the facility achieved an astounding 4.6% reduction in waste, which is the equivalent of 115 tons. The site reached its zero-waste-to-landfill goal through an awareness campaign and a partnership with a local incinerator plant in Turin, which will reuse the portion of waste items identified as “not directly recyclable” as fuel. Co-Winner: Fuel Oil Consumption – Cataño, Puerto Rico – The facility, which is the largest premium rum plant in the world, decreased fuel oil consumption by 35% (from 0.084 gal/pg to 0.052 gal/pg) — the equivalent to 400,000 gallons of fuel oil. With this fuel reduction, Cataño, Puerto Rico, home to BACARDÍ® reduced its greenhouse gas emissions (GHG) by an astonishing 25%. Co-Winner: John Dewar & Sons Transition to Biomass – Royal Brackla, UK - The Aberfeldy and Royal Brackla John Dewar & Sons Limited distilleries made the transition from the exclusive use of heavy fuel oil to 100% clean-burning renewable fuel biomass and substantially reduced the amount of GHG emissions they produce. Together, the changeover to biomass nearly cut energy use at the sites in half. At the Aberfeldy distillery, the ecofriendly change has reduced GHG emissions by an extraordinary 2.2kg of CO2 per liter of alcohol produced. At Royal Brackla, once the transition is complete, GHG emissions will be reduced by an equally astounding 1.73kg of CO2. Honorable Mention: Glass Bottle Recycling – India – At the India BACARDÍ® rum facility, 315kg of CO2 GHG emissions are saved per ton of glass recycled. The bottle recycling plants also use steam recovery systems that reduce fuel and water consumption by 70%. The bottle-recycling project in India is projected to reduce CO2 emissions by about 1,400 tons from FY16 to FY17. Winner: Arandas, Mexico – The office, which supports the crafting of the CAZADORES® and CORZO® tequila brands, reduced its energy use from 12,156kW to 2,026kW, which represents an 83% reduction in CO2 GHG emissions — the equivalent to the amount of energy used in eight houses, monthly. To accomplish this task, the team members consolidated 12 offices into one larger office. They also have gone as paperless as possible, changed over to solar-powered lighting and use water-free toilets. Honorable Mention: Jacksonville, United States – The bottling facility for BACARDÍ® rum conducted three environmental initiatives that involved the removal of 30 printers, 100 large office waste bins and all plastic cutlery. Winner: Bacardi USA Supply Chain & Ryder System, Inc. – As one of only 11 companies nationwide to receive a coveted U.S. EPA SmartWay Excellence Award, Bacardi USA manages to do more, sustainably, with less energy and emissions through its partnership with Ryder. Since 2008, Bacardi USA and Ryder have worked together to institute the EPA’s SmartWay Program and have successfully reduced carbon emissions by more than 20%. In 2009, 65% of Bacardi shipments out of its Jacksonville, Florida, bottling facility were over the road. In just six years, Bacardi USA reversed that with just 35% of shipments by truck; 65% by rail. In the last nine years, Bacardi USA reduced the weight of its packaging by more than 7%—equivalent to taking 1,100 full truckloads off the road. Honorable Mention: Pessione & Artimestieri, Italy – Cork Plugs Initiative – The Pessione facility’s discarded MARTINI® cork stoppers are delivered close by to Artimestieri, a non-profit cooperative and environmental advocacy organization, to be reused for natural decorations and green building. This program saves approximately 100,000 corks from becoming landfill waste in Italy. Winner: Ian McLaren, Coral Gables, USA – Bacardi Trade Advocacy Director Ian McLaren, a sought-after speaker on sustainability, led a no-straws campaign at the Company’s North America regional headquarters office in Coral Gables, Florida, and has inspired other Bacardi facilities including the Company’s gin distillery in southern England to do without non-biodegradable straws and stirrers. The internal response and commitment to take the “No Straws” pledge from Bacardi offices, distilleries and brand homes was immediate. Within two weeks, all brand homes and visitor centers made the commitment. By getting rid of straws at its in-house events globally, Bacardi will prevent an estimated 650,000 straws and stirrers from entering landfills each year. Honorable Mention: Jonathan Wilson, Aberfeldy, UK – For the first time ever, the Aberfeldy distillery is national accredited as a Silver Standard “Green Tourism” site because of Mr. Wilson’s many environmental programs such as using green consumables and office supplies, and the implementation of a new no-straws policy, among many other things. The award recipients and their individual campaigns represent only the tip of the iceberg with regard to the many Bacardi Limited Good Spirited activities that took place over the last fiscal year that produced sizable reductions in water, GHG emissions, and waste to landfill. Many strategies also involved community support, increased biodiversity, key stakeholder engagement with government, media and customers to impart benefits within the local communities the Company serves. Overall, the sum total of every initiative, from the smallest to largest, has improved environmental awareness and made the Bacardi company name synonymous with sustainability. With environmental stewardship weaved into the fabric of the Company’s culture from the beginning, the launch of the Bacardi Limited Good Spirited environmental initiative marked the beginning of new era of accountability for the Company and all of its brands worldwide. Good Spirited has challenged Bacardi employees to accelerate innovation and creativity and demonstrate their true passion and support for the premise that environmental conservation is a collaboration that starts with personal responsibility. BACARDI, THE BAT DEVICE AND OTHER MARKS ARE TRADEMARKS OF BACARDI & COMPANY LIMITED OR OF OTHER SUBSIDIARIES OF BACARDI LIMITED.